Here's the biggest ships ever made in the world. These ships come from various categories. There are cruiser ship, cargo, warship and tanker as well. These ships is one of the achievement of the transportation technology as well as the human. Let's take a look at those biggest ships ever made in the world to see how big they can be. Largest warships, aircraft carriers, is owned by the United States Navy. USS Enterprise is the largest carrier of the Nimitz class. This Nimitz class super carrier is equipped with the respective 2 nuclear reactors created by Westinghouse that drive 4 steam turbine that connected to 4 propeller shafts. the turbine engine produces 260.000 horsepower that can drive ships with a speed of 30 + knots. By this means the ship's nuclear reactor was not necessary to be "filled" for 20 years. With the logistic system which is owned by the US Navy allows this ship to sail round the world non-stop without having to stop and lean on the logistical port to recharge. With a length of 340 meters, 78 meters beam and draft of 12 meters, the Nimitz-class super carrier have 101.196 tons displacement. Total crew on board is 5.700, consisting of 3.200 sailors and 2.500 air wing. Total aircraft that can be carried is 85 units. It's the combination of F-18e / F Super Hornet, EA-6B Prowler, E-2 Hawkeye, C-2 Greyhound, SH/HH-60 Seahawkdan S-3 Viking. Berge Stahl is registered in Stavanger, Norway. This vessel previously registered in Monrovia, Liberia. This ship was built in 1986 by Hyundai Heavy Industries. This ship is now owned by Singapore company BW Group. Because of its large size, this ship can only be fully docked at two ports in the world, the Terminal Maritimo de Ponta da Madeira in Brazil and the Europoort near Rotterdam in the Netherlands. The biggest cruise ship is ever made today is Oasis of The Seas, that owned and operated by Royal Caribbean International. Oasis of The Seas was registered in Nassau, The Bahamas. Oasis of the Seas Construction cost around $ 1,4 Billions in 2006. It is one of the most expensive ship ever built. The Oasis of the Seas is The most Luxurious ships ever built in the world. The ships was built by STX Europe shipyards in Turku, Finland. The total weight is 225,282 GT witht the total lenght is 360 m 1,181 ft. The biggest container ship is owned by the container Ship company Maersk Group. The ship is named EMMA Maersk, and it's the largest container ship that has been operated. This ship is capable of containing nearly 11.000 TEU's (Twenty feet Equivalent Units), not less than 1.400 container more than the ability of other ships. That's according to the stability limit of the vessel in accordance with company policy, with assuming the weight per container is 14 tons. But this ship is basically designed to contain 14.500 TEU's. The ship was built by Odense Steel Shipyard Danish in 2006. There is an interesting fact when the ship was being built. There was a large fire broke out on accommodation deck and bridge deck which caused much damage. But everything could be repaired quickly and the vessels were completed on time. The ship is named EMMA Maersk, which is the name of Maersk Mc-Kinney wife, the founder of Maersk Group. This is the king of all supertankers, and possibly if viewed from its dimension is the largest ship ever built. In term of the ships that still operating, this is indeed the largest ships. The Carrers stories are also quite interesting. Knock Nevis, or T.T. Jahre Viking is the largest ship ever built. This is a super tanker with a class ULCC (Ultra Large Crude Carrier), ship length is 485 meters (1503 feet), when the ship was standing then the ship will be taller than the Petronas Twin Tower. Jahre Viking has a depth of 25 meters in fully laden. Because of its large size, the Jahre Viking can not pass through the canal of Panama or Suez Canal and even the English Channel, was not passable. Cargo capacity (deadweight tonnage) of the Jahre Viking is 564.763 tons, Jahre Viking can carry about 650.000 m³ (4.1 million barrels) of crude oil (crude oil) once sailed. Jahre Viking was originally built with a displacement of 480.000 tons by Sumitomo Heavy Industries yard in Japan in 1975 with hull number 1016, which later named Seawise Giant. Have You ever want to sail with one of those biggest ships ever made in the world? Stavanger, Norway. This vessel previously registered in Monrovia, Liberia. This ship was built in 1986 by Hyundai Heavy Industries. This ship is now owned by Singapore company BW Group. 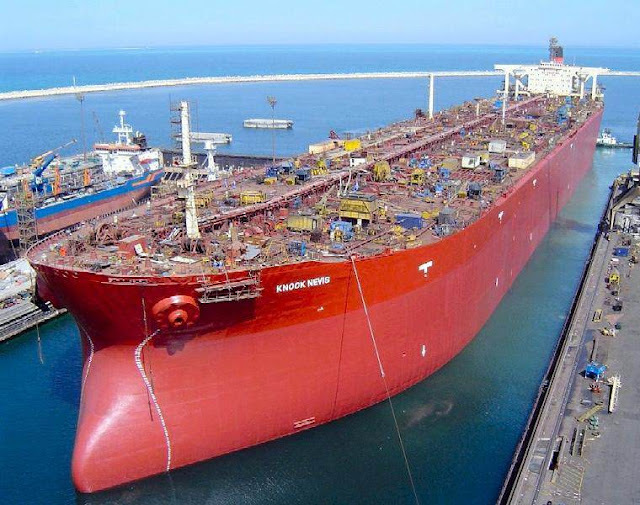 Because of its large size, this ship can only be fully docked at two ports in the world, the Terminal Maritimo de Ponta da Madeira in Brazil and the Europoort near Rotterdam in the Netherlands.